Without night vision goggles, mammals have no hope of seeing infrared light, which has wavelengths longer than light on the visible spectrum. But in a study published today (February 28) in Cell, researchers injected nanoparticles into mouse retinas, giving the rodents the ability to see near-infrared (near-IR) light at about half the resolution of visible light. Coauthor Tian Xue, a vision scientist at the University of Science & Technology of China, says the work began when he sat down with Gang Han, a materials scientist from the University of Massachusetts Medical School. One of Han’s specialties is upconversion nanoparticles, which convert long wavelengths of light to shorter wavelengths. Because mammals only see light that’s about 400 to 700 nanometers, it occurred to Xue that it might be possible to use the nanoparticles to extend an animal’s visual spectrum. 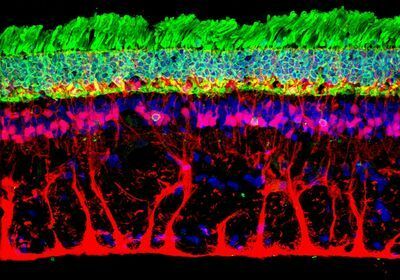 It’s a very clever idea that they can piggyback on existing circuitry in the retina. Han, Xue, and their colleagues first tried injecting the nanoparticles into the retinas of adult mice, but it wasn’t until they coated the particles with concanavalin A—a protein that binds to sugars and proteins that cover the mouse photoreceptors—that the nanoparticles distributed fairly evenly through the retina and stuck tightly to the rods and cones. They found that when exposed to near-IR light of about 980 nanometers, the nanoparticles emitted light in the 550 nanometer range, which appears green in the visible spectrum. Then the authors did electrophysiological recordings of individual photoreceptors to show that the coated cells were activated by near-infrared light. They also showed via electroretinograms and electrophysiology in the visual cortex that infrared light activated retinal circuits and that signals from those circuits were communicated to the brain. Next, the researchers assessed whether the signals they traced from single photoreceptors to the brain meant that the animals could actually see the near-infrared light. 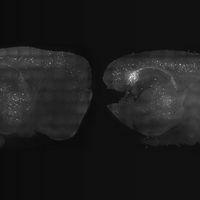 They first showed that the pupils of injected mice, but not controls, constricted when exposed to 980 nanometer light. Then, they gave animals a choice of two boxes: one that was completely dark and one illuminated by near-infrared light. 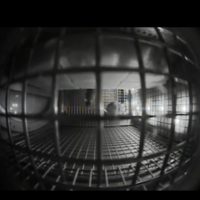 Control mice spent equal amounts of time in the two boxes, but mice with nanoparticles injected into their retinas favored the dark box, suggesting that they could perceive the near-IR light and preferred to be in the dark. 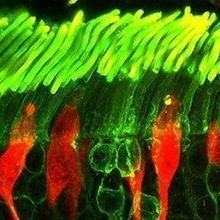 This image shows nanoparticles, in green, binding to the rods (violet) and cones (red) of the mouse retina. Once the research team knew the animals could perceive the light, they next investigated whether the mice could distinguish shapes. They trained animals to find the exit of a Y-shaped water maze by a figure that was projected on a screen above it. They found that the animals with nanoparticles in their retina could distinguish some shapes—including squares and circles—projected in near-IR light in both darkness and when some visible light was present. But the near-infrared light spatial resolution was lower, about half of visual light spatial resolution. 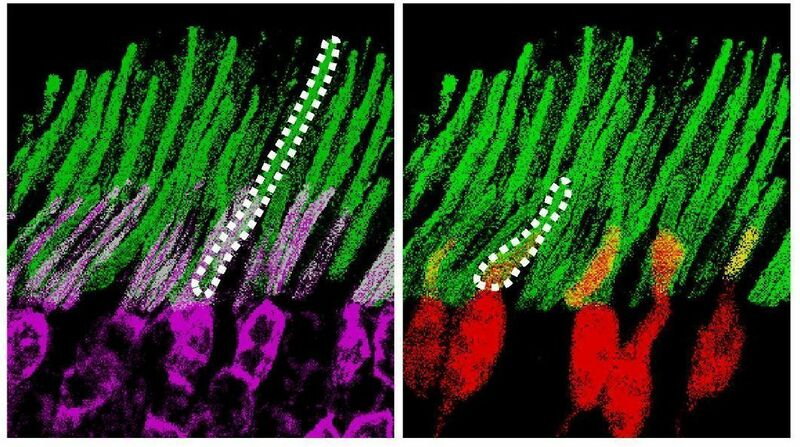 “We speculate that the nanoparticles can also activate the nearby photoreceptors, so that makes a little bit [of a] blur,” explains Xue. The future directions of the work, he says, include modifying the nanoparticles to improve their sensitivity to near-IR light and trying the injections in larger animals, such as pigs and nonhuman primates. Y. Ma et al., “Mammalian near-infrared image vision through injectable and self-powered retinal nanoantennae,” Cell, doi:10.1016/j.cell.2019.01.038, 2019.